And this devastating news comes on the heels of the National Marine Fisheries Service’s proposal to authorize more than 90,000 miles of active seismic blasting. Based on the results of this study, the affected area would be approximately 135,000 square miles. In the study, scientists found that the blasts from a single seismic airgun caused a statistically significant decrease in zooplankton 24 hours after exposure. Abundance fell by at least 50% in more than half (58%) of the species observed. The scientists also found two to three times more dead zooplankton following airgun exposure compared to controls and, shockingly, krill larvae were completely wiped out. 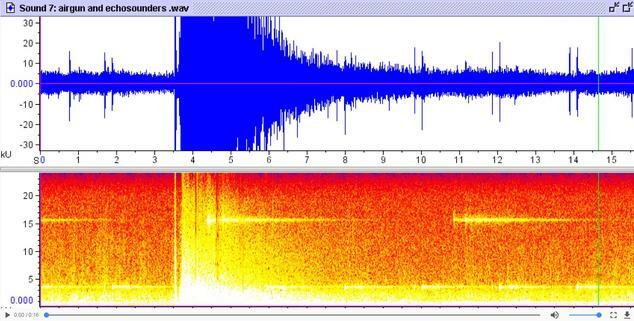 Audiogram of a single seismic airgun. Seismic vessels in the Atlantic will tow up to 40 airguns at a time, which will all blast simultaneously every 10 seconds for months on end. The scientists used sonar backscatter, a method that reveals where animals are in the water column using sound, to detect zooplankton. They describe witnessing a large “hole” opening up in the backscatter as zooplankton were killed. Food chains are surprisingly simple in the ocean and zooplankton help form the basis of them, underpinning the ocean’s productivity. Significant damage to zooplankton will have cascading effects on animals higher up. That includes fish and marine predators such as sharks, marine mammals, and even seabirds. Adult krill provide an important food source for our largest marine animals: the great whales. However, these findings are based on the results from a single airgun with a volume of 150 cubic inches. The companies proposing to conduct blasting in the Atlantic will use vessels that will each tow an airgun ‘array’ comprising between 24-40 airguns, with a combined value of 4808-6420 cubic inches. The guns will all blast simultaneously, every 10 seconds, 24 hours a day, for months at a time. This means the proposed surveys could affect zooplankton over much larger areas. Krill represent a vital food source for many marine predators, including large whales. 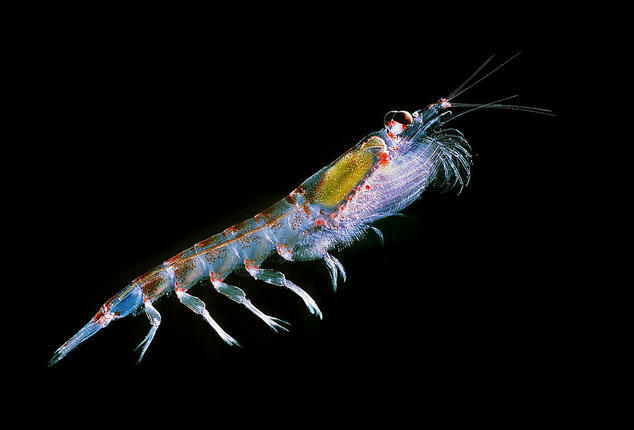 In the study, seismic blasts completely wiped out krill larvae. The Nature study measured impacts observed in the first 24 hours following exposure to seismic blasts, but there is strong evidence to suggest longer term impacts following exposure to airguns. In marine invertebrates, damage to important sensory receptors called “statocysts” has been observed to increase with time up to 96 hours following exposure to noise. Stress caused by exposure to seismic elicits a similar immune response in both lobsters and scallops,1 indicating that the blasts may impair the health of a wide range of marine organisms. 1 J. Semmens, R. D. Day, Q. P. Fitzgibbon, K. Hartmann, and C. J. Simon, “Are seismic surveys putting bivalve and spiny lobster fisheries at risk,” Presentation at Oceanoise2017 Conference, Vilanova i la Geltrú, Barcelona, Spain, 8-12 May, 2017. Available here, page 92. 2 M. Wale, R. A. Briars, M. G. J. Hartl, and K. Diele, “Effect of anthropogenic noise playbacks on the blue mussel Mytilus edulis,” Presentation at the 4th International Conference on the Effects of Noise on Aquatic Life, Dublin, Ireland, 10-15 July, 2016. Available here, page 213.